A few months ago, I was considering to buy myself a Sun Broadband Prepaid kit for back-up purposes if ever my Digitel DSL goes down at home. If I remember it right, its cost was still P1425 at that time, much expensive than other broadband sticks in the market. So I waited a bit, hoping that the price will go down. 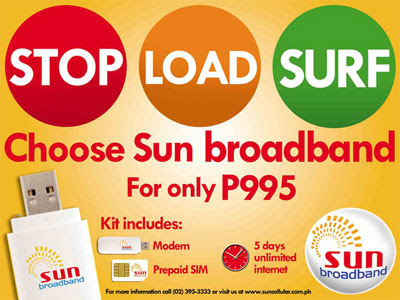 Good thing, I waited :) Now, you get a Sun Broadband Prepaid kit pre-loaded with 5 days unlimited internet for just P995. SIM and USB modem are already included.